It is with some relief that I report that I have finished the Paint by Numbers puzzles, and made some progress on the Battleships. I’ll be closing out the Logic section entirely before long, and that will leave just the three most lightweight categories: Trivia, Visual, and one that’s new to Games Interactive 2: Word Search. I haven’t mentioned the word searches yet, because they’ve never been the focus of my play sessions. And yet I’ve almost finished them. Let me get this out of the way: Word searches are a joke. They’re the puzzle type that fans of all other types of puzzles look down on. 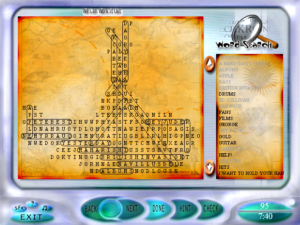 Logic puzzles require real thought, crosswords test your knowledge and vocabulary, and cryptograms combine all of the above, but all a word search requires is the ability to not be bored by word searches. The reason I’ve gotten so many of them done is that I’ve been doing them one at a time between other puzzles in order to avoid having to do them all at once. It’s one thing for a variety puzzle game to have one or two word searches for variety’s sake — one per issue of the magazine was pretty much the right amount, if you ask me — but this game has twenty. That’s more than any other single puzzle type except crosswords. The word searches from Games Magazine have one real point of interest: The unused letters spell out sentences, usually some quotation linked to the puzzle’s theme. As far as I know, this was never stated outright in the magazine. It was just a little bonus for those who noticed it. The closest they came to spilling the beans was in a March issue with an Irish-themed word search for St. Patrick’s Day: the editor’s message for the issue mentioned that the editor had suggested slipping some Irish names into the unused letters, only to be told “Wait til you see what we’ve already got going on there”. So at that point, not even the editor of the magazine was in on the secret. But that anecdote was enough for me to catch on, and now, the information proves useful: looking for the hidden sentences provides a welcome shortcut to finding all the words, in addition to making the whole process less tiresome. As you’re probably expecting if you’ve been following these posts, there are problems. There are occasional typos in the word lists: SUBSITUTE for SUBSTITUTE, BARBEQUE where the grid contains BARBECUE. Such words cannot be marked in the grid; the game only accepts what’s in the word list. Occasionally there’s a word that’s left out of the word list entirely. You can tell that it’s supposed to be part of the solution because it interferes with the secret unused-letters text, but it’s just not there. One particular puzzle is missing something like half of its word list. I only have a vague sense of what the unused letters were supposed to spell out in that one. In one of the puzzles, part of the grid was actually misplaced, showing letters one space to the right of where they should have been. It took me a while to figure out what was going on there. Once again, I find myself thinking that some of these bugs could make good puzzles in their own right if deployed deliberately. The UI is mainly reasonable, but has one biggish problem: words are marked with ovals around them, and these ovals are sometimes wide enough to intersect with adjacent letters, especially when the ovals are diagonal. 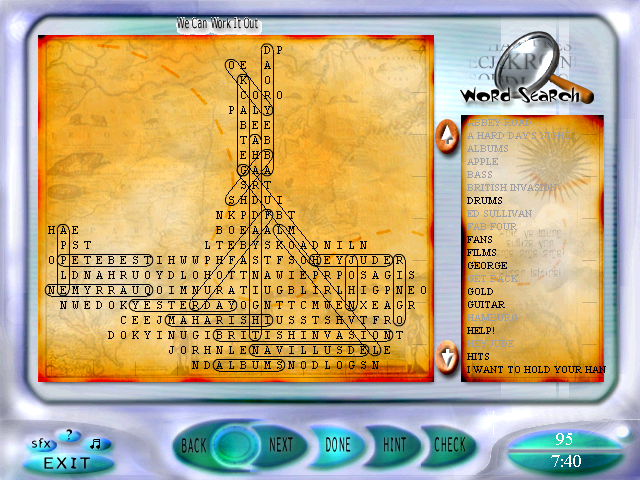 Now, the puzzles come in different sizes, and the larger grids are fit on the screen by using a smaller font. Throw a couple of lines across the smaller font and it becomes illegible. It’s not hard to think of solutions to this. Like, instead of circling the words, put a line through the marked letters! Ideally, make the line a light color and display the letters on top of it so you can still read them. But I suppose you can’t do that in the print version, so it violates the game’s prime directive. A somewhat tepid defense of word searches: They can indeed be brute-forced with enough patience–but you’re at least going to start by looking for the words to jump out at you, and if you’re doing this the puzzle designer can incorporate the kind of tricks and deceptions and surprises that you get in good versions of other puzzles. The difference is that you can always grind out the last ones you got. It might not be too unlike jigsaw puzzles in this request, where if worst comes to worst you could in theory try every piece with every other one (caveat: I’ve barely done any of the really artful handmade jigsaws). Or maybe like a five-letter jumble–yeah, you can write down all 120 combinations without much trouble, but it wouldn’t be any fun. Now I mostly get this idea from watching small children do these puzzles, so it’s not like they’re that challenging. Definitely all one-star puzzles. This old post isn’t that relevant but I like the comment. Word searches with mistakes in the word list that don’t let you enter the correct solution seem like the worst, though.